Nearly 50 per cent of the country is currently facing drought with at least 16 per cent falling in the "exceptional" or "extreme" category, according to IIT Gandhinagar scientists managing India's real-time drought prediction system. 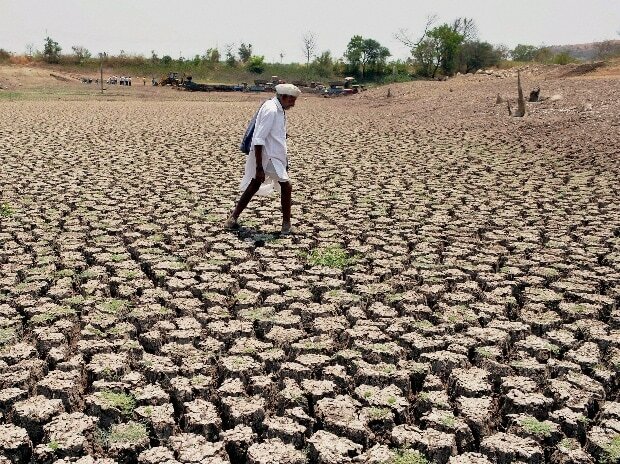 This ongoing drought will pose a lot of challenges in water availability this summer, Vimal Mishra, associate professor at the Indian Institute of Technology (IIT) here, told PTI. The real-time monitoring system run by his team, which includes PhD student Amardeep Tiwari, collects weather and precipitation data from the India Meteorological Department (IMD), which is then used to simulate soil moisture and other factors that contribute to drought. The results of the simulations, prepared by the Water and Climate Lab at IIT Gandhinagar, are available on the website of the India Meteorological Department (IMD). "About 47 per cent of the country is facing drought -- with 16 per cent facing extreme, or exceptional category of drought -- which we show from our real-time monitoring system that we have developed for the country," said Mishra, who heads the lab. "Arunachal Pradesh did not get good rain this year, and parts of Jharkhand, southern Andhra Pradesh, Gujarat, and northern part of Tamil Nadu are under drought," Mishra said. If these areas experience very hot summer before the onset of monsoon, it could lead to a crisis, he warned. According to him, the continuing drought will further burden the already depleting groundwater resources of the country. "We are not enhancing groundwater recharge. On the other hand, drought conditions are making us extract more and more water," he said. While famine-like conditions are not expected, the drought will have a massive impact on the economy. "It can create long-term stress, if not mortality for poor, marginalised farmers," Mishra said. The scientist said global warming and climate change are likely to exacerbate drought in the coming years. "If our groundwater is not recharged and managed sustainably, we could face a very difficult situation in the coming years," Mishra said, adding that groundwater is being used irresponsibly at present. "You can reduce groundwater by selecting appropriate crops. If we already have depleted groundwater we should not grow water-intensive crops. For example, Punjab should not be growing rice," Mishra said. "The government needs to take some tough decisions as far as ground water, and water conservation is concerned," Mishra said. Conserving water in urban homes is just a drop in the bucket compared to steps that can be taken in the agriculture sector, he said. "Of course, conservation should be encouraged at every level, but the elephant in the room is agriculture. Eighty per cent of our total fresh water is used in agriculture sites, rather than residential sites," he said. "The government thinks drought is a reactive situation, that they will provide a relief only once there is a crisis But with the data available they can take proactive measures to prevent a water crisis," Mishra said.